The Hotel, Culinary Arts and Tourism (HCAT) Institute at Anne Arundel Community College won first place and several students earned individual medals in the 5th Annual Chesapeake Culinary Cup competition held recently at the HCAT Institute kitchens in Glen Burnie. The Chesapeake Culinary Cup is an American Culinary Federation (ACF)-sanctioned competition salon open to regional college culinary arts programs. Each school entered a 4 person team with three savory and one pastry contestant. The scores of all four students from each school were tabulated to determine an overall team score. ACF competition individual medals as well as team trophies were awarded. In addition, the student from each school with the highest score was recognized during the awards ceremony. 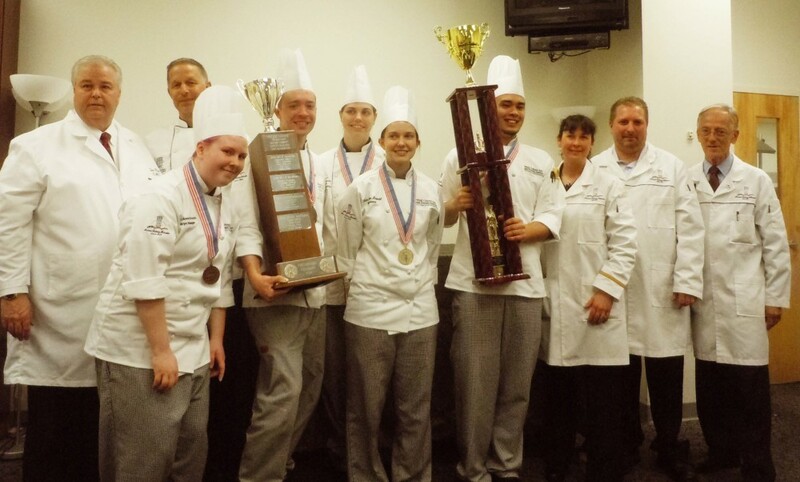 Team Anne Arundel from the Hotel, Culinary Arts and Tourism Institute at Anne Arundel Community College poses with their medals and trophies after placing first in the Chesapeake Culinary Cup competition. Additional competition categories were offered to baking and pastry students who competed for ACF medals. Winning a Bronze Medal was Heather Tompkins of Severn for a Pastillage Showpiece. AACC’s HCAT Institute includes credit degree and certificate programs, continuing education certificate and certification programs and courses for personal enrichment. Meet HCAT advisers and college representatives, find out about specific programs and see student demonstrations by attending a free information session from 6 to 7 p.m. Thursday, June 13, in the Humanities Building Room 214, AACC Arnold campus, 101 College Parkway. For information, call 410-777-2398 or visit www.aacc.edu/hcat.